Japanese developer Compile Heart is best known for its simple and quirky JRPGs that are recogznied for their easy-to-understand gameplay and copious amounts of fan service such as the Neptunia and Fairy Fencer franchises. But Dark Rose Valkyrie is meant to be a divergence from the company’s tried-and-tested formula that, while still providing some fan service, takes on a more serious tone than the studio’s other games. Dark Rose Valkyrie is set in an alternate history version of 1929 Japan. A meteorite called the “Black Garnet” has fallen to Earth and has spread a virus which causes humans to turn into monsters called “Chimeras.” Players take on the role of Asahi Shiramine, the new leader of an equally new special military unit called the Special Force Valkyrie tasked with hunting down Chimeras in the hopes of finding an end to the outbreak. Dark Rose Valkyrie’s cast of characters, most of which are female, are both diverse and stereotypical of Japanese video game and anime/manga character archetypes. There’s the entitled rich girl, the all-too-serious soldier, a pair of contrasting fraternal twins, a ladies’ man, a kind-hearted laundryman, and more. Interacting and getting to know each of the characters is one of the most interesting parts of the game and one of the most important as the game introduces a secondary and more important narrative. 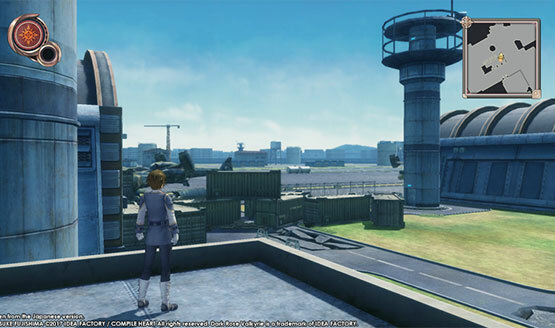 As players progress into the game, they soon find out that one of the members of Special Force Valkyrie is a traitor and finding out which one it is quickly becomes the game’s primary goal. Discovering and exposing the traitor is done through interviewing each of the members and trying to figure out who the traitor is based on their statements. This adds an addition layer of challenge and immersion to the game as it requires the player to really get to know each character to spot which one is the traitor. This narrative point also makes character progression in the game slightly more challenging as it forces players to become wary of which members of the party to bolster or invest in as any of the them can turn out to be the traitor. Finding out that their strongest character was actually the enemy, while not a game breaker, can be quite the downer, especially considering how robust character progression is in Dark Rose Valkyrie. As previously mentioned, the character progression in Dark Rose Valkyrie is pretty robust. Instead of a mindless, automatic leveling system and a set roster of equipment, the game allows players to manually spend points on character attributes as well as customize and upgrade equipment. The cost of upgrading certain character attributes are expensive and differs per character though which, in turn, encourages players to really think about which attribute to focus or specialize in per character. As for equipment, characters can equip a main weapon called the TCS that can be upgraded and customized with add-ons called Armament Parts which can include ranged weapons such as assault rifles and missile launchers or defensive parts like shields. 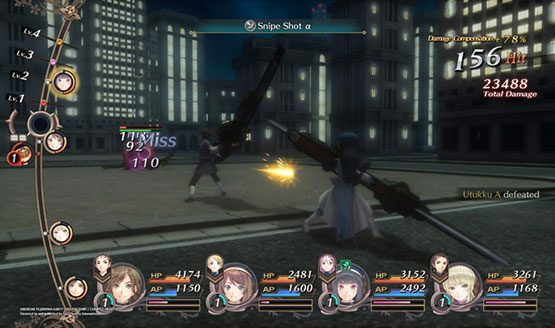 Mixing and matching armament weapons can give characters new and different attacks and combos that can be a mixed of melee and ranged attacks, giving the game a unique depth and complexity. Characters can also wear armor and accessories that bolster their defenses and attributes as well as outfits that dictate the character’s overall look. As the game does come from Compile Hearts, it isn’t surprising that the characters’ outfits can slowly be destroyed through combat and, if not repaired, may leave the character in just their underwear until the outfit is fixed, which could prove to be the more efficient way to go about things as constantly repairing outfits can get expensive. Unlike typical turn-based JRPGs, Dark Rose Valkyrie utilizes an active, speed-based system where character and enemies moves and abilities need time to activate after being chosen, depending on their speed as well as the ability used. This forces players to think about their characters’ speeds and abilities and strategize an effective plan of attack. This becomes especially apparent once enemies become tougher and more numerous. 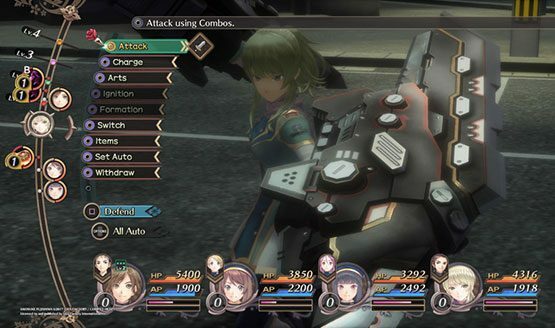 Players can have up to four active characters at a time in the battlefield while the other four will act as support. The support characters are able to perform several moves such as providing an additional defense. The four active characters will have access to customizable combo attacks, solo or team-based abilities, and both Ignition and Overdrive modes that makes you immune to negative status effects and improves your capabilities, respectively. Like many other JRPGs, the 2D visuals of Dark Rose Valkyrie are impressive. 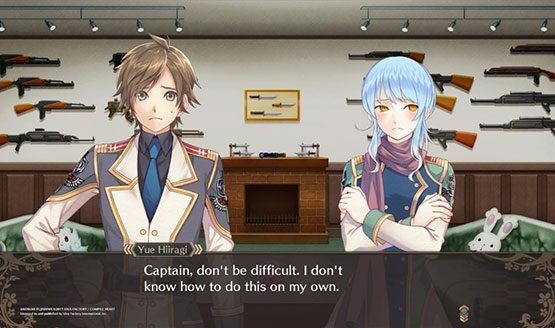 The game’s dialogue sequences follow the same style of many other JRPGs and visual novels, with their elaborate backgrounds, text boxes, and 2D characters. But Compile Heart has taken this format to another level by slightly animating the characters during dialogue, which is a rather nice addition although the animation can look awkward at times. On the other hand, the 3D environmental visuals of Dark Rose Valkyrie are probably one of its biggest weaknesses. While the design and style of the environments look decent, the quality and detail just leave much to be desired. The game does make up for it slightly with some decent level design that provides a good mix of ease & complexity. While you’ll rarely get lose in any of the game’s maps, finding hidden paths and areas still provide a bit of a challenge. The game’s array of missions does tend to feel repetitive at quite a number of times during the course of the game. Missions usually involve going to an area to hunt an enemy or a group of enemies. In some cases, players are tasked to defeat a specific enemy that players will have to search for, which can get quite tedious without any means of tracking the specific beast. Even the usual kill quests can get tedious when it requires you to through group after group of the same enemy. 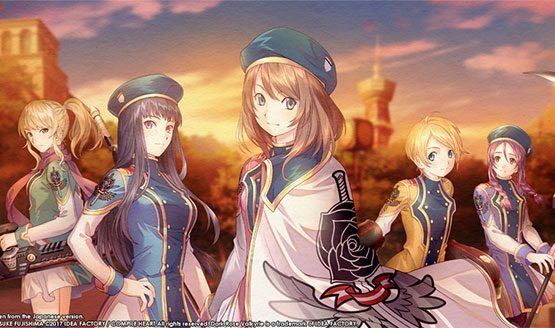 Dark Rose Valkyrie is an unexpected experience and could be the best game from Compile Hearts yet. An undeniable mixed bag, the game provides deep and complex combat and character progression systems as well as a unique narrative and objective that’s somewhat held down by its repetitive and tedious missions as well as its dated 3D graphics. Fans of JRPGs, especially those by Compile Heart, that are able to forgive some of the game’s shortcomings will definitely appreciate and overly enjoy the game and the amount of depth and complexity it can provide. Review code for Dark Rose Valkyrie provided by publisher. Reviewed on PS4. For more information on scoring, please read our Review Policy here.